The details: Small field but with good representation from Marx and Bendorf (8 riders), Nashville Cyclist (4 riders), and Team Type I (2 riders). I was very aggressive at the beginning and followed Travis (Marx and Bendorf) on an attack from the line. I sat up after about half a mile though. Then there were some attacks and two riders got away: a Marx and Bendorf rider and a Nashville Cyclist rider. I attacked a few times to try to get something going – but everything was getting chased down and covered well by Marx and Bendorf. 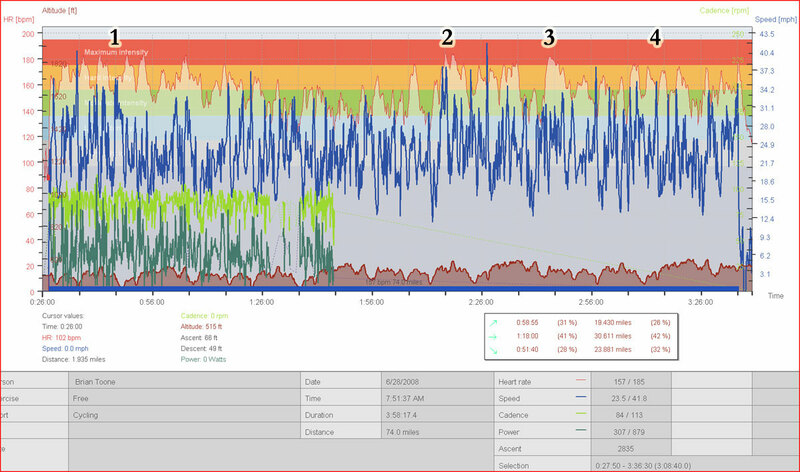 Then the race got real easy as Team Type I rode tempo. I got in the mix too and rode tempo a bit. There was one other rider who also helped out with keeping the break in check, but it was mostly Team Type I. Eventually, the break of two had a lead of about two and a half minutes. At this point, Marx and Bendorf started to send riders off the front. This increased the pace and by the end of the third lap (out of 4) we had brought the lead back down to just 30 seconds and we could see the break up the road. There was a flurry of attacks, and Nate Brown (Hot tubes development) bridged across to it. A little while later the Nashville cyclist rider popped. At this point, it became a very tactical race as suddenly I had to make sure that I was in any break containing a Team Type I rider. Two guys got away late (nashville cyclist and marx and bendorf) and Team Type I led the chase. The leadout coming across the last big hill was the two Team Type I riders, Mike Olheiser (Marx and Bendorf) and then me. Our group caught the two guys who were off the front of the group right in the middle of the sprint. I navigated around them but couldn’t come around Joe or Mike so I finished 3rd in the field sprint, 5th overall. I believe Nate Brown got the win in a very close bike-throw sprint with Sam Silvey (Marx and Bendorf). Here’s my heart rate and power data. Unfortunately, my cadence magnet slid down during the race and stopped reading – this also turns off the power meter! So I only have power readings for the first lap and a half. This entry was posted in Racing and tagged heartrate, power, Racing, road race on June 28, 2008 by kartoone.